If you gave Picasso brushes that frayed after a few strokes, even his genius would’ve turned into mind-numbing mediocrity. An artist is only as good as the tools he uses and a barber or cosmetologist is nothing, if not an artist. Barbers especially can’t achieve anything without proper tools. So, the question is what tools do barbers really need? If you’ve just finished barber school and are looking for a comprehensive barber tools list, then you’ve come to the right place. We not only have a full barber tools list but also recommendations on which brands and products you should consider for each of those categories. You can go to any of those categories via the following navigation panel but we also recommend reading the rest of the guide. What Variables Are Important When Choosing Barber Tools? Being a barber or cosmetologist is not just a profession. It is a lifestyle. What you do during work hours is going to affect your entire life. If you do a lot of haircuts in the day, you’ll end up feeling it in your hands and arms well into the night. Not only that, your shoulders will be tighter and your feet and legs will be sore as well. You have to play the long game. You have to think in terms of years and decades not weeks and months. Here are a few variables you should be considering while choosing barber tools. While 3 pounds may not seem like much, holding it 6 hours a day and 6 days a week for months will have an impact on your physiology. On the other hand, your tools can’t be too light because that will take away from their maneuverability. But, what weight is right for you depends on your body shape and endurance levels. Whether your hands are small or large will determine what size your tools need to be. Bigger tools are not only tough to grip but also prevent you from doing justice to your task. Tools that are too small create problems too. Managing a smaller tool with big hands is as detrimental to your muscles, tendons, ligaments, and bones as handling a big tool with small hands. While size and weight matter, the ergonomics matter a lot more. An ergonomically designed tool can really reduce stress, irrespective of how heavy it may be. On the flip side, you can get the lightest tool in the world but if it isn’t ergonomically designed, it will feel like you’re cutting hair with a brick. The materials that have been used to manufacture your tools are important too. The nature of those materials will affect multiple things. The second is heat conductivity. Metal heats up faster and retains more heat too. Plastic resists heat and will melt if it gets too hot. The third is vibration. Metal vibrates more and is, thus, more harmful physiologically. Plastic absorbs vibration. The fourth is cost. Metal tools will always cost more than plastic tools. You have to work with financial constraints and prefer to upgrade later. You can’t spend too much but still need multiple features, swivels 360 degrees. You’re not worried about money and won’t settle for anything except the best. 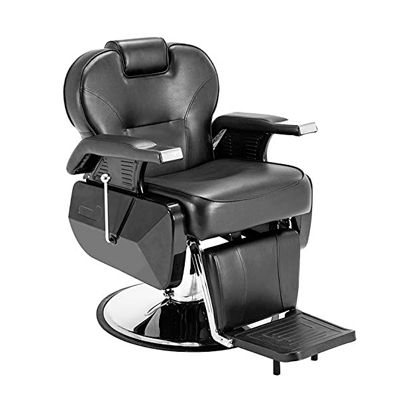 View on AmazonA good barber chair offers three things – comfort to the client, adaptability to the barber, and durability to the business on the whole. This barber chair from Artist Hand offers all of those things without burning a hole in your business’s finances. This means that it is not too expensive but still offers near premium features and quality. If your clients are not comfortable while availing your services, some of which may take time, they will never come back. This is why their seat needs to be as comfortable as possible. This chair is big enough to hold even the biggest people. It has a large seat, wide backrest, a comfortable headrest, and even a platform footrest to cater to their comfort. Further, the seat boasts of high-density foam padding which has just right balance of firmness and malleability. The footrest is foldable as well. You will find it easy to work on your clients if they’re in this chair simply because of the versatility that it offers. It has the full 360 degree swivel feature, its backseat can be reclined to up to 145 degrees, and its headrest can be detached if required. Moreover, its hydraulic pumping mechanism is very effective and easy to manage. You can use it to increase the height by nearly 10 inches. Built with stainless steel and PVC leather, the chair is also durable enough to last for years with minimal maintenance. Even the padding has double re-enforced saddle stitching which ensures that it doesn’t come undone. If you decide to buy this chair, you’ll have three options to pick from – black, brown, and burgundy. While a very good purchase, this chair does have its flaws. For instance, it isn’t very easy to assemble and can sometimes even be delivered with key parts missing. The cost of this chair falls in the medium bracket. 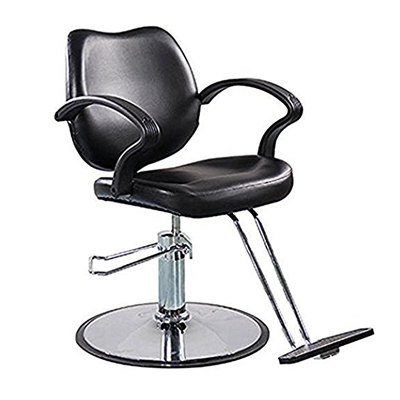 If you find it a bit too expensive, the FlagBeauty Barber Styling Chair we’ve also shortlisted is at a lower range. You’ll have to compromise on quality with that choice but, at the end of the day, you’ll save a lot of money. On the flip side, if you’re looking for a more advanced option, you can choose to go with the premium Vanquish Hydraulic Chair. The Vanquish may be priced unbelievably high but its features, quality, and post sales service are unparalleled. It is simply a class apart. You’re willing to compromise on sharpness to save money. You’re okay with sharpening your scissors off and on. You don’t mind paying a little extra for lasting sharpness. View on AmazonThe one thing that barber shears are expected to deliver flawlessly is cutting power. A pair of barber shears that aren’t sharp or don’t stay sharp is pointless, especially since they’re the tool that a barber uses the most in his day. In terms of cutting power and the durability of the cutting edges, the Equinox Professional Razor Edge Series stands out the most. 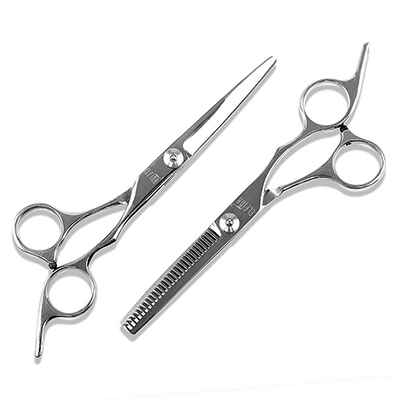 The product is a set of hair cutting and hair thinning scissors that are made of high quality Japanese stainless steel. The edges on these scissors are hand-sharpened and you’ll see their sharpness as soon as you do your first cut with them. Further, their Japanese stainless steel construction means that the sharpness is durable and the scissors don’t get blunt if used too much. Equinox offers six variations for this product. There are basically two handle designs which the company presents as ‘A’ and ‘B’ and two types of scissors i.e. thinning and cutting. You can choose to order any of them individually or as combinations. These scissors are ergonomically designed which means that they boast of a very comfortable grip. They measure the standard 6.5 inches and are fairly lightweight too. However, barbers with thicker fingers may be limited to the type ‘B’ option because type ‘A’ finger holes may be too small for them. A very attractive feature of these scissors is the tension and adjustment screw. Changing this screw setting can make a world of difference in how tactile these scissors are for you during cutting sessions. The scissors are delivered well-oiled inside a protective vacuum sealed package. This packaging ensures that they reach you in pristine condition and without flaws. Further, their tips are rounded to ensure proper safety. However, if you have a tendency to use the pointy tips of your scissors, then you may want to look at other options. Both our alternatives in this category are cheaper than this set with the ELFINA Set being the cheapest. The Elfina set also happens to be the dullest of the three and you may need to sharpen it regularly. 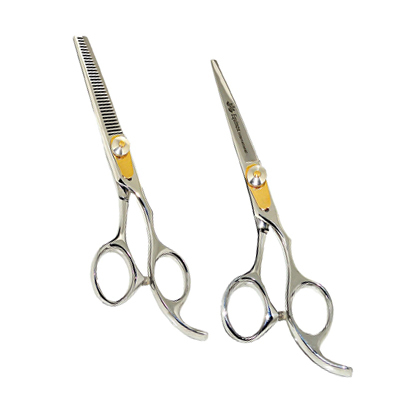 The ULG set’s price falls in the mid-range and the scissors are as sharp as Equinox. However, they tend to lose their sharpness over extended use which brings up questions about durability. You want a high quality traditional hair dryer other than BaByliss PRO. You want the most highly barber recommended hair dryer in the market. Money is no bar and you want the most cutting edge hair drying technology in your shop. View on AmazonDyson’s hair dryers are all the rage in the top barber circles. The reason for this is that their hair dryers are built around cutting-edge supersonic technology. 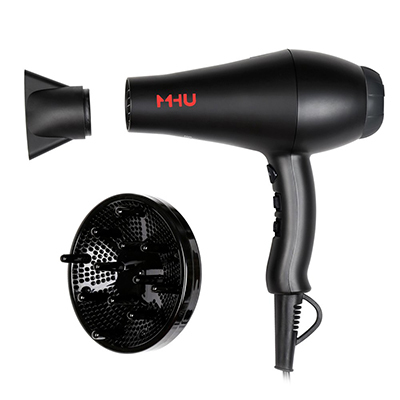 This means that this hair dryers significantly quieter, more powerful, and more efficient than all their competitors. This hair dryer is so advanced that it automatically competes with professional grade traditional options like the BaBylissPRO Ceramix Xtreme and the MHU Professional. Unfortunately, this also means that Dyson’s offering is significantly more expensive than the other two. The question is whether it is worth buying or not. We think it is. 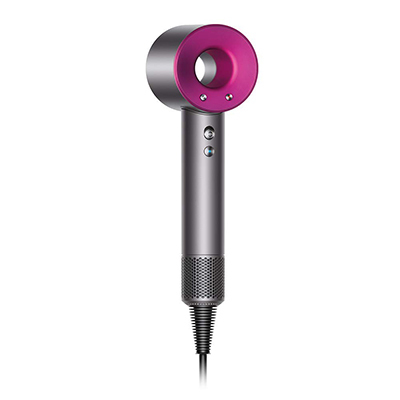 The Dyson hair dryer’s primary claim to fame is that it prevents heat damage. It has sensors that manage the heat levels so that they never reach the point where hair gets harmed. According to the company, its sensors measure air temperature 20 times every second! The dryer relies more on concentrated air power at the right temperatures instead of overheated air. Despite this, the device is surprisingly faster than traditional dryers when it comes to drying hairs. Moreover, its unique design also means that it isn’t noisy. This unique combination means that your clients won’t need to cope with excess heat or sound produced by your hair dryer. Further, it will end up saving time for the client and you both. This hair dryer is easy to use as well. It has 4 heat settings and 3 speed settings which can be managed through two different buttons. It also comes with 3 attachments, namely the smoothing nozzle, the concentrator, and the diff user. Further, the dryer comes with an 8.5 feet long heavy-duty cord that should be enough for most salons. You can get this device in two colors – iron and fuchsia. It’s also possible to get a bag with your order but you pay extra for that. There are two major drawbacks of this device. The first is its unbelievably high cost. 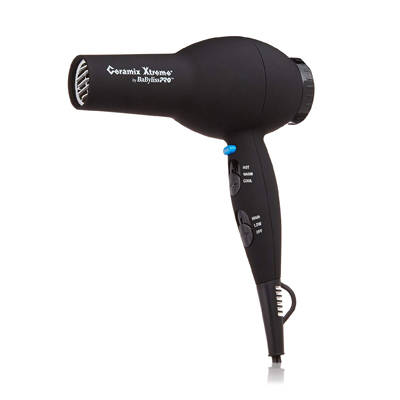 It’s a considerable investment and most people are not okay with paying so much for a hair dryer. The other drawback is its weight. This is a heavy device and its balance is different from what you may be used to from using traditional dryers. This is because of its design. It has its motor and air intake in a long handle. This means that all the weight is in the handle. It also means that you’ll take some time to get used to it. You may even have to watch some videos to figure out how to use it properly. 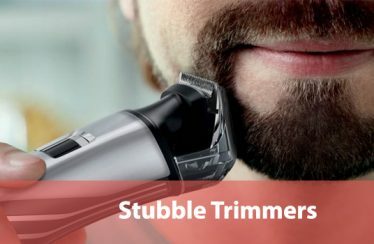 You don’t have too much money to spend and have need of hair trimmers as well, built in adjustable taper. You want cordless commercial grade hair clippers and don’t mind giving up on some power to get them. You want commercial grade hair clippers with all the bells and whistles that a professional will ever need. View on AmazonHair clippers tend to see the most volume of work in a barber shop since shears and trimmers are used more for refinement. Therefore, hair clippers are the real workhorse companions for barbers. This is why most professional barbers and cosmetologists recommend the Wahl Professional 5-Star Series Senior Clippers #78545. These clippers offer maximum precision, power, and durability and are a part of Wahl’s commercial grade series of products. They’re based around the company’s most powerful V9000 electromagnetic motor which is housed inside the very durable aluminum housing. The blades on these clippers can be adjusted as per requirements and boast of zero-overlap capabilities. ‘Zero overlap’ is a term used to describe the fact that the moving and stationary blades are placed precisely against each other. Clippers without this capability tend to have overlapping blades which means that they don’t cut as closely as they should. 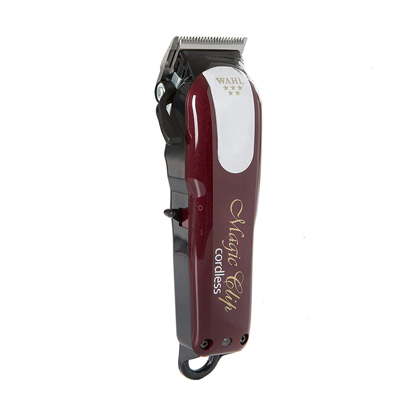 Therefore, these clippers are extremely sharp and capable of delivering the closest cuts possible. However, this also means that using these clippers takes some skill. In fact, beginners are advised not to go for these clippers even if they have the appropriate qualifications as they’re a handful. For example, these clippers are very heavy which means that it is easy to make mistakes with them, especially since the blades are so sharp. Further, they can also get hot pretty fast and only experience will teach you how to pace such clippers so that they don’t get too hot too fast. Finally, they’re also very loud and noisy. It’s worth noting that you’ll still have to align the blades on these clippers straight out of the box. Along with this, regular oiling of the blades is a requirement to keep them functioning properly. The device has built in adjustable taper lever and comes with 3 cutting guides. Other accessories that have been provided include a red blade guard, a cleaning brush, oil, and a styling comb. Even though they help, you shouldn’t be relying on the provided cutting guides since they’re not as durable or perfect as the clippers. 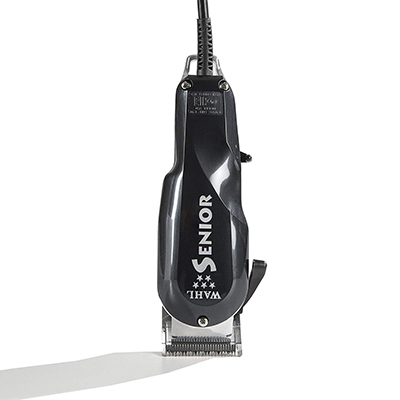 Luckily, these clippers support the standard attachments that all barbers buy separately. These are corded hair clippers with a commercial long-length cord. If for some reason (e.g. you take house calls) you need your clippers cordless, we recommend the Wahl Professional 5-Star Magic Clip #8148 model. Just bear in mind that operating on batteries will require you to compromise on power. You’ll end up saving money on the #8148, however. 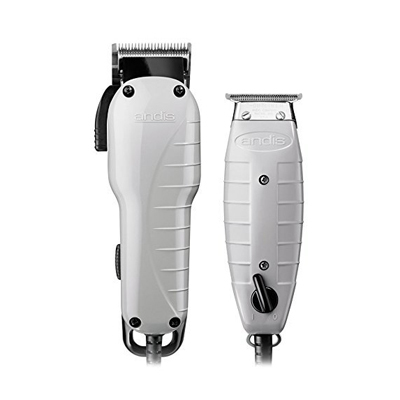 If you want something even cheaper, you should go for the ANDIS Professional Barber Combo – CL-66325. The combo is cheaper as it is but what makes it a steal is that you get clippers and trimmer both for a much lower price. You’re looking for a good classic design straight razor and want the option of buying them as a part of the entire kit. You don’t need multiple variations to choose from and don’t want Equinox, super sharp edges. 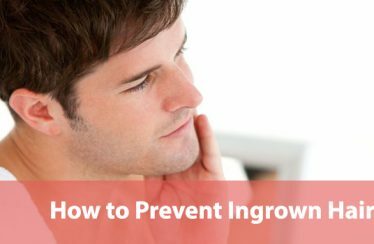 You have sufficient experience handling straight razors or if you’re willing to put time and effort into learning. View on AmazonEven though clippers and shears do most of the work, you’ll pick up the straight razor if you want to refine a cut or clear out the fuzz. 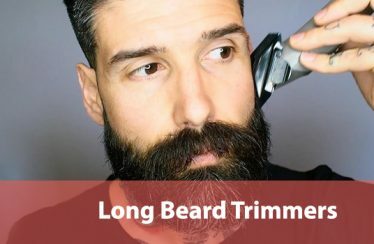 While trimmers may be useful in that regard as well, they have nothing on the flexibility and control offered by a straight razor. 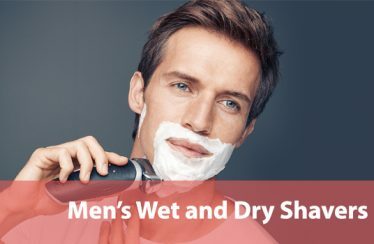 However, that is only if the straight razor you’re using offers the right kind of balance and reliability of the blade. Our top pick of this category, Equinox Professional Straight Edge Razor, offers both those things and then some. It is comfortable in the hand and will last you a very long time. 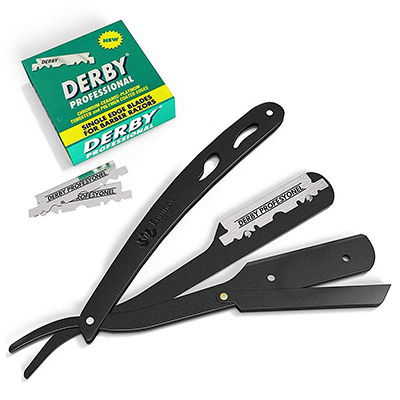 Further, it comes with a pack of 100 professional grade blades from Derby and the blades are super sharp. 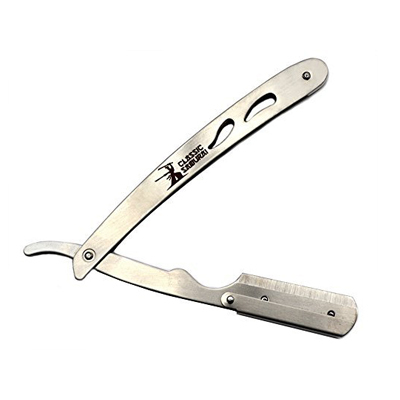 The manufacturer offers the straight razor-blade combo in five different versions. The versions differ in terms of the type of blades being offered and the finish on the razor i.e. either matte black or steel. Our other two straight razor picks are equally good and similarly priced. We just picked this one because it offers the most variations. The Utopia Care Barber Straight Edge Razor comes with Derby blades as well but only offers two versions. The Classic Samurai CS-102 Barber Straight Edge Razor has a more classic design and offers six variations but is not as well-known as Equinox. We should, however, point out that one of their variations is the entire shaving kit. Therefore, if you want the complete shaving kit, you should go for these. The Equinox straight razor also comes with a 30-day risk-free money return offer. It has one major flaw, though. This is the fact that its locking mechanism isn’t as durable as the rest of the razor. After extensive use, the mechanism can get a bit loose and difficult to manage. 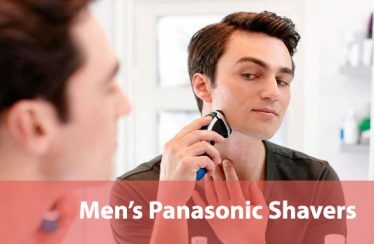 You should also know that straight razors require a considerable amount of skill. There could be severe cuts if you’re new to the whole business. Quality is not a criterion for you and you just want the cheapest option possible, contains 12 combs. 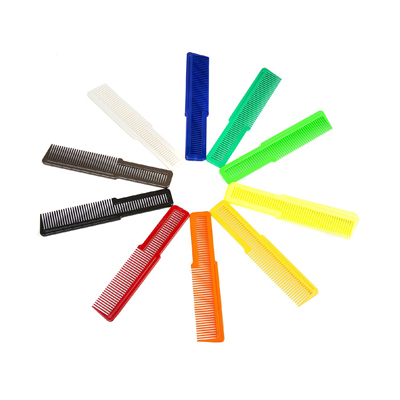 You want the full range of combs with multiple handle types and can overlook quality issues. You want branded and color coded combs but don’t need multiple handle shapes and sizes. View on AmazonOf the three combs set that we’ve shortlisted here, the one from Wahl is the best in terms of quality. 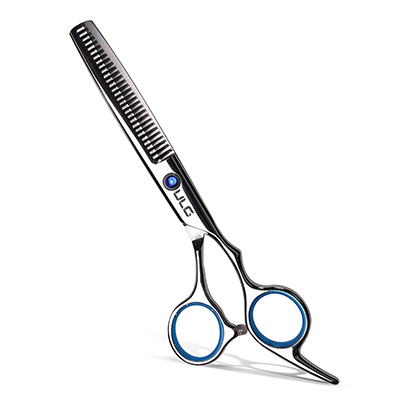 The Le Fu Li 10pcs/Set, however, is the most versatile because it has different handle styles on its combs. 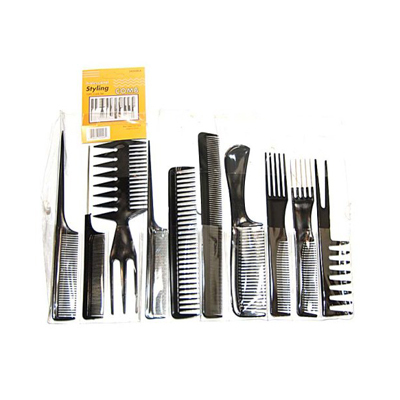 The Magic 10 Piece Styling Comb Set is similarly versatile but the production quality of the included combs is low enough for it to not qualify as our top pick. The Wahl set is our best pick in this category mainly because it doesn’t have as many flaws as the other two. It is a part of the manufacturer’s “commercial grade line” which means that the combs are specifically designed to cope with the demands of a barber shop. 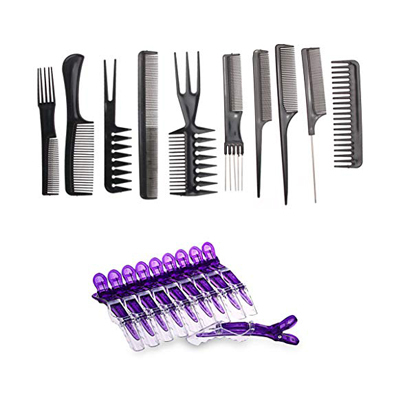 Apart from excellent build quality, this set is special because it contains combs of varying colors. This adds to their usability as they can be assigned specific roles and will be easy to find amidst clutter. The most commonly found colors in the set are pink, orange, bronze, green, red, yellow, royal blue, florescent green, florescent yellow, white, and black. The colors, however, aren’t fixed so you should be prepared for surprises. Their biggest flaw is the fact that they don’t offer multiple handle styles like other barber styling combs sets tend to do. Moreover, they may even be a bit too narrow to be used as support for clipper runs. You want an apron that can handle chemicals and liquids in addition to hair. You want to save some money and are willing to settle for a generic design. You want maximum functionality and want to look good too! View on AmazonAn apron’s primary purpose is to hold the tools and prevent clipped hairs from reaching the clothes of the barber. However, if it can add some style to the barber’s appearance, then it has to be considered special. By that definition, this apron from Facón is special. It is handcrafted PU leather that you can get in 4 different colors. The colors you can choose from include red, brown, blue, and black. Since it is made of leather, it does have its distinctive smell. However, if you’re not a big fan of that scent, you can get this apron in denim too. Still, it will be a compromise because PU leather will always be a more long-lasting material than denim. Additionally, this is a very functionally sound barber apron. It has seven pockets with one located on the chest and the others placed at the waist level. The apron barely has any weight of its own but when you put your tools in it, it will get heavy. One of its best qualities is that it has a two-button adjustable neck strap. 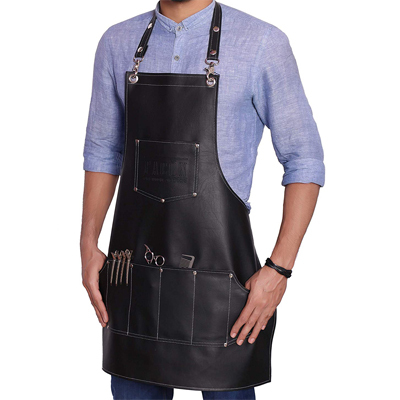 The two-button configuration makes it easy to fit the apron on any individual, irrespective of the thickness of their neck. While the two-button system is helpful, the straps themselves could’ve been longer. The top half of the apron is also a bit too narrow. While it will be fine for most people, women with bigger bust may find it a little comfortable. Similarly, the apron may not provide proper coverage to men with wider chests. In fact, the apron could’ve been bigger on the whole. 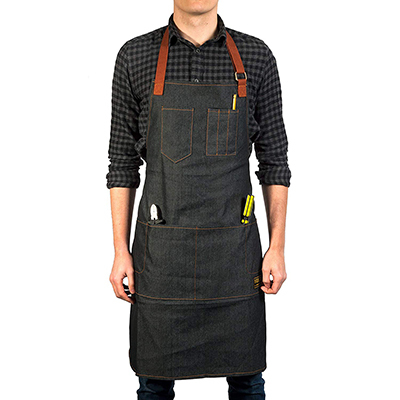 If anyone taller than 6 feet tries to put this apron on, they’ll only get protection up to their upper thigh. The apron, however, is fairly easy to clean. Firstly, it doesn’t catch cut hairs because it resists static. Further, the material is such that you can simply brush or wipe off hairs. Surprisingly, the manufacturer also offers a lifetime guarantee on this apron. The two other aprons we’ve shortlisted here are cheaper than this one but they’re also not as unique. 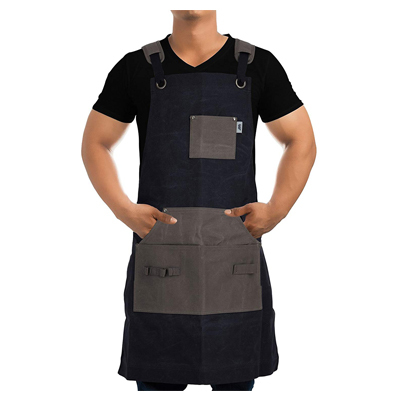 The Vulcan Workwear Utility Apron is denim which means that it isn’t that easy to clean. The Premium Rhino Apron is even easier to clean than our top pick. It can even handle chemicals and liquids. The problem is that it is quite basic and traditional in terms of its appearance. The best that you can do with that one is choose between the two offered color options – black and brown. You want a printable, hair repellant barber cape at an excellent price, adjustable neck snap. 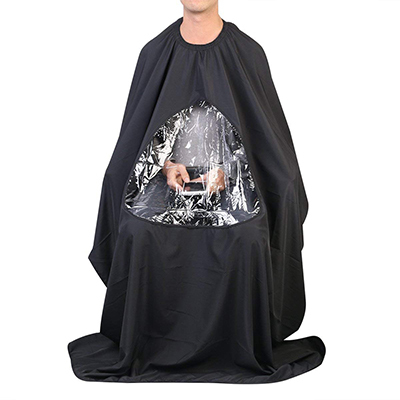 You want a fully waterproof barber cape with the cool gimmick of viewing window for clients. 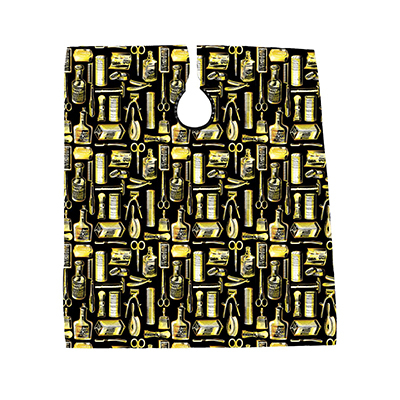 You would like to have a designer barber cape with a traditional print on it and don’t have to worry about the cost. View on AmazonThere is really no point to having different capes for kids, ladies and men. It is much more efficient to have a good cape with clasps that can deal with varying neck sizes. This is why the Salon Sundry cape is so popular with barbers. Its adjustable snaps mean that it will fit on all types of people, including even children. This is a massive advantage as it will increase availability of the capes and functionality of the shop in general. However, early on, you may find these snaps to be a bit too stiff. As you continue to use them, however, you can expect them to loosen up and become easier to use. 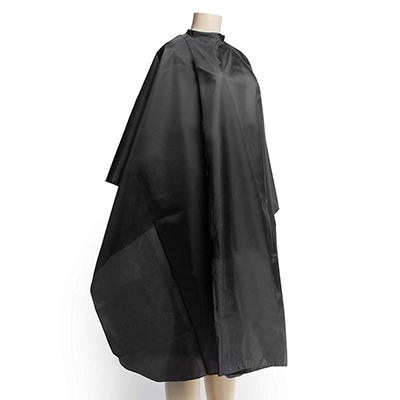 This barber cape is made up of nylon and is available in the standard black color only. The nylon allows it to be both lightweight and breathable. However, this breath ability comes at a cost i.e. this cape isn’t waterproof. Even though it doesn’t let water through quickly and it only soaks through slowly, we don’t recommend using it for services involving liquids. For such uses, we suggest going for the ULTNICE Cape. It is completely waterproof and can even handle chemicals. The ULTNICE cape is made of silk crepe and even has a very cool viewing window. The clients can use the viewing window to look at their phones while getting a haircut or a perm. The cape is available in four different colors. The Betty Dain Vintage Print Barber Cutting Cape, however, offers even more options with six colors to choose from. Even though the Salon Sundry cape we’re reviewing here doesn’t offer color options, it is printable. You can easily customize the cape by printing your barber shop logo on it. It measures 50 x 60 inches and even has a sewn in loop, in case you like hanging capes. However, the back of the cape could be longer as it only reaches the middle of the back of the average individual. One of its more important qualities is how easy it is to clean it. Hairs literally slide off this material and if a few strands stick around, you can just wipe them off casually. You want a soft neck duster at an incredible price with multiple variations to choose from. You don’t need your neck duster to be extra-soft but definitely need one that will last a very long time. You need your neck duster to be super soft and have no qualms about spending a lot for quality. View on AmazonEven if you have the best barber cape in the world, clients will still end up with some hairs on their faces and necks. It is effectively inevitable. This is why you need to have a good neck duster at hand. This neck duster from Diane is a good option, especially since it offers just the right mix of variety, effectiveness, and economy. It is this rare blend that makes this neck duster so popular. 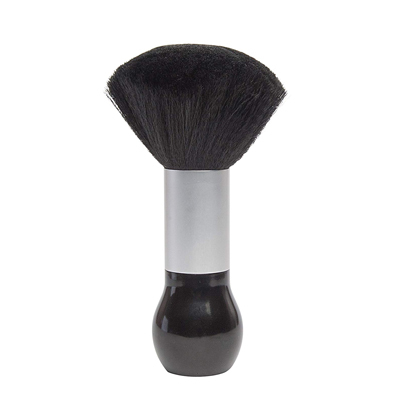 It boasts of extra-soft nylon bristles. The bristles are very gentle which is why they work well for people with sensitive skin as well. Their softness, however, means that they shed a bit too much. This makes us think that these dusters may not be as durable as barber shops with a lot of footfall will want them to be. In fact, the Anself Neck Duster will be a better option in terms of durability because it boasts of natural fiber bristles. 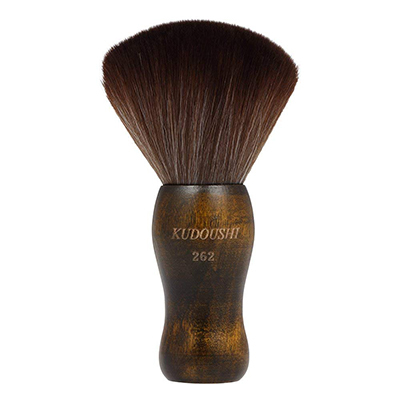 At the same time, this means that its bristles may be a bit rougher and not the best for handling sensitive skin. This neck duster is also priced highly. However, the cost is justified because it has a more traditional build with wooden handles. Moreover, it is explicitly designed for professional setups that see heavy-duty use. Our third pick, the HairDay Care Neck Duster Brush offers softer bristles just like the Diane neck duster but it does cost much more. The Diane neck duster also offers the most variations. It is available no less than 8 different variations! These include multiple sizes, quality, and features. In contrast, the HairDay Care neck duster comes in two versions and the Anself neck duster offers 4. One of Anself’s variations is an apron-neck duster combo if you’re looking to buy them both. All of them offer ergonomic plastic handles. Further, they can all be stood up with ease. 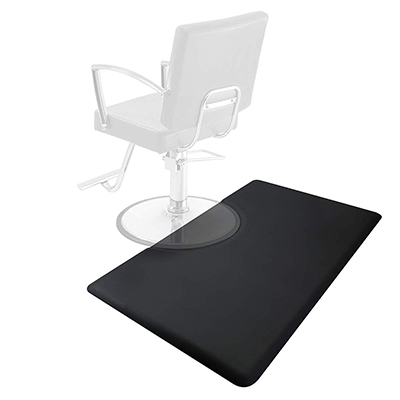 You want a barber floor mat and would like the option to choose from multiple thicknesses. You’re okay with a semi-circle barber floor mat and appreciate a nice print on it as well. 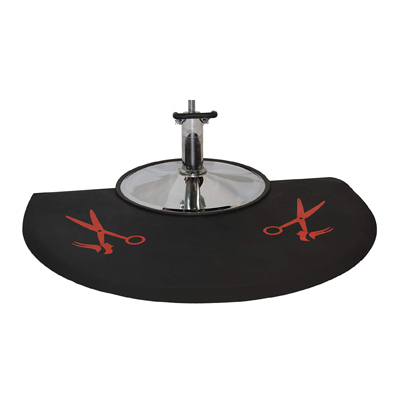 You want a plain, semi-circular barber floor mat without any prints on it, 3 thicknesses to choose from. View on AmazonBarber shops and salons have floor mats because of two reasons. The first is that they’re easy to clean and the second is that they provide people with a soft surface to stand on. Since a barber or cosmetologist spends a lot of time standing, a softer surface reduces the stress on his legs and feet. 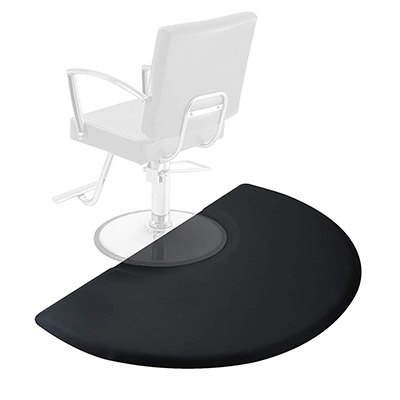 This floor mat from Saloniture is good at both those functions. It is built with high-density foam that is not only comfortable but also very durable. The mat resists everything from scuffing to punctures and tears. It can even handle high heels! This mat is also waterproof and easy to clean. You can simply sweep or wipe hairs off it. You don’t even have to worry about stains too much. The manufacturers are so confident of the durability of their products that they offer a one-year warranty on them. Further, this floor mat is textured which means that it isn’t slippery. It even has tapering edges that nullify the risk of trips. The tapering edges also allow trolleys to be moved on and off the mats with ease. There’s even a cutout on one side where you can place your barber chair. Be mindful of the fact that the cutout is circular in shape. 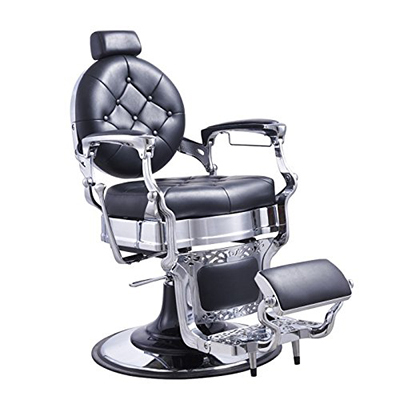 While most barber chairs have circular bases, you may have square-base barber chairs. In this case, this barber floor mat may not meet your requirements as perfectly as it does for everyone else. You can get this floor mat in three different thicknesses – 0.5 inches, 0.62 inches, and 0.87 inches. The other floor mats we’ve shortlisted don’t offer any thickness options. Further, both of them are semi-circle in shape. The LCL Beauty Barber Floor Mat, however, has scissors printed on it. In terms of flaws, the rectangular floor mat from Saloniture can end up creating static with enough rubbing. This can make cleaning it a little difficult. Also, sometimes, its edges don’t stay down and require special attention. If you don’t want to spend too much but still want a sign to advertise your barber shop. If you want a traditional barber pole and want to save some money as well. 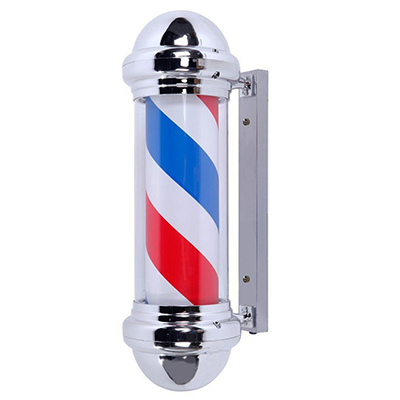 If you want an extra-small, traditional barber pole and don’t mind spending more. View on AmazonA barber pole is purely an aesthetic tool. Its job is to make your salon or barber shop look good and easy to spot from a distance i.e. better visibility. This barber pole from Mefeir is a classic, red & white, wall-mounted electric pole that not only lights up but also spins to draw the eye. It is a bright pole sign but doesn’t consume too much power as the light is produced by 7W LED light stripes. It is built with both stainless iron and plastic. The wall mount is made up of stainless iron while the pole itself is ABS plastic. While it can be installed outdoors, you need to give it some kind of a roof or it may not be able to handle inclement weather. It is very easy to install as well. The company has even provided the appropriate accessories such as screws, plugs, and hooks. In terms of electrical connections, it just needs two switches – one to turn on the light and one to turn on the spinning motor. You can get this device in three different sizes. The smallest one measures 30 inches and the biggest spans 41 inches in length. The third option is 32 inches long. 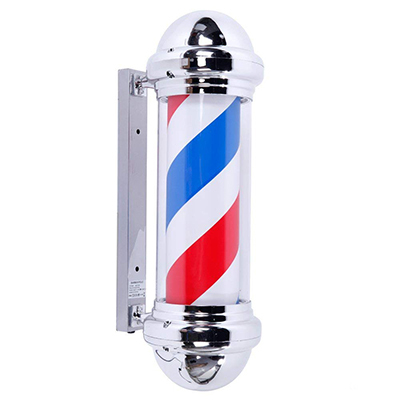 A good alternative to the Meifer barber pole is the Clevr 30″ LED Barber Pole. While it costs a little more, it offers four options. These include lengths of 23 inches, 28 inches, and 30 inches. The 30-inch option can be purchased with either LED or normal bulbs. The third option we’ve shortlisted i.e. 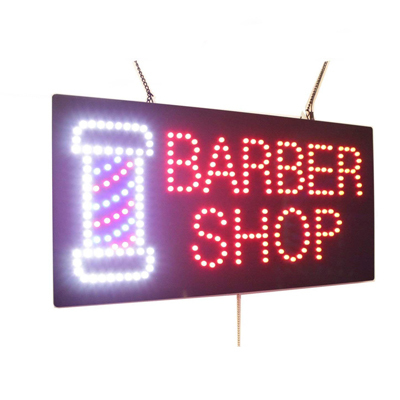 LED Open Sign, is not a barber pole. Instead, it is a simple sign with LED lights on it. The lights are arranged to spell a wide variety of things ranging from “Barber Shop” and “Welcome Open” to even stuff like “Hot Coffee”. You’ll have 12 options to choose from if you decide to go for this product.